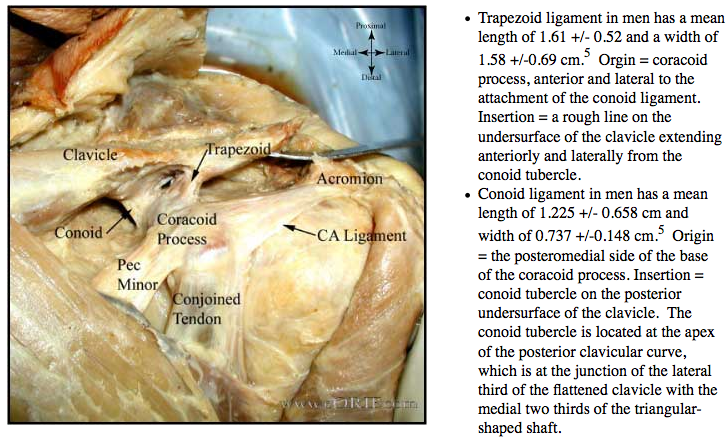 Arthroscipically assisted AC reconstruction (Baumgarten KM, 2006;22:228). Beach chair position with a bump under the affected scapula. All bony prominences well padded. Prep and drape shoulder and ipsilateral leg in standard sterile fashion. Consider tourniquet on affected leg. Gracilis=rounder, palpable, proximal. Proximal attachment is circumferential, i.e. after harvest you should note muscle fibers coming off both sides of tendon. If only on one side you may have harvested semitendinosis. Semitendinosis-flat, larger, broader insertion, difficult to palpate. Muscle fibers only come off one side of tendon proximally. Dissection to sartorius fascia, incise fascia just above Gracilis. Isolate gracilis with Penrose drain. Deeper structure surrounded by fat is saphenous vein and nerve, stay away from them. Prepare tendon on back table with #2 non-absorable whip stitch in distal end. Tension under 10-20pounds of pressure with graft-master. Graft should be at least 15cm long. 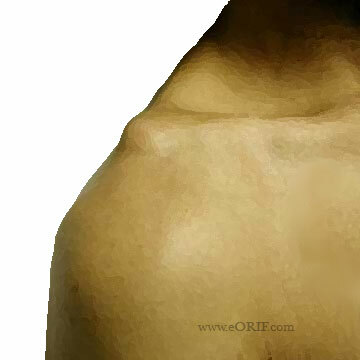 Mark out bony prominences on the skin (shaft of the clavicle, head of clavicle, scapular spine, acromion and coracoid). Inject skin around incision with 1% lidocine with epinephrine to aid in hemostasis. Oblique modified saber cut incision from the AC joint to just above the coracoid process. Raise flaps deep to the subcutaneous fat medially and laterally exposing the distal clavicle and AC joint. 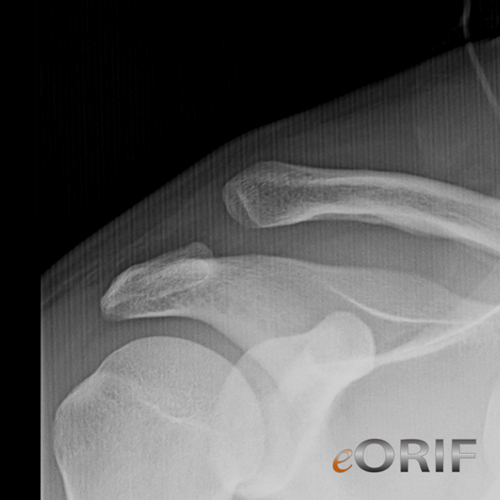 Expose AC joint with a longitudinal incision along the distal clavicle. Deltoid and trapezious insertions are reflected subperiosteally of the distal clavicle. inspect AC joint and excise the articular disc if severely damaged. 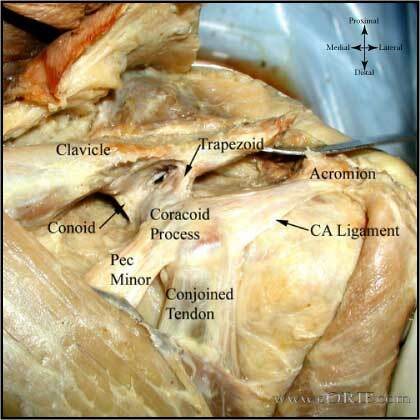 Expose superior surface of coracoid process. Drill a guide wire from superior to inferior at the junction of the lateral third and the medial two thirds @2mm from the posterior border of the claivicle ending in the palpable conoid tubercle on the undersurface of the clavicle. This recreates the insertion of the conoid ligament. Over drill with a a 4.5mm endobutton drill. Second 4.5mm drill hole created in similar fashion @ 15mm lateral to the first in the midline of the clavicle to recreate the insertion of the trapezoid ligament. 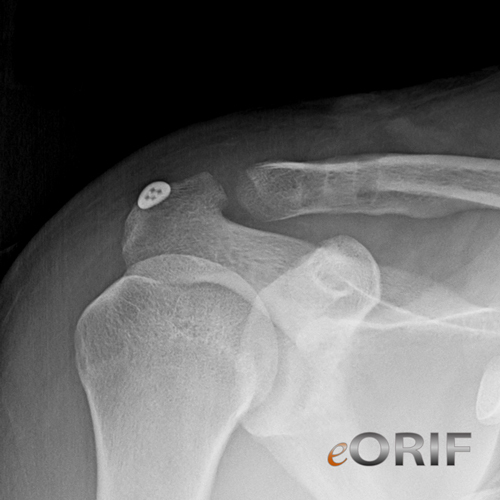 3.0mm Arthex retrobutton guide pin is then drilled from medial to lateral in the acromion centered in the anatomic location of the distal clavicle. Whip stitch is then tide to a retrobutton @ 10mm from the end of the graft. Hewson and curved suture passers as well as passing sutures are then used to pass the graft/retrobutton from superior to inferior throught the medial clavicle drill hole, then around the undersurface of the coracoid process, back up throw the lateral clavicular drill hole and finally threw the acromion retrobutton tunnel. The retrobutton is seated onto the lateral acromion. The medial protion of the graft was then tightened restoring the AC joint to its anatomic configuration. The graft is then sutured into itself to maintain the reduction and recreating the conoid, trapezoid and superior AC ligaments. Deltoid and trapezious muscle origins are then repaired with 0 vicryl suture utilizing the the tendon graft on the superior surface of the clavicle for added fixation.